Today is Thanksgiving Day in the United States. This national holiday is typically a day of feasting with family and friends and more football games than you can shake a turkey leg at. There are three NFL and two NCAA college games today. If that is not enough to satisfy you, there are 66 other college games and 12 more NFL games this weekend. And, of course, tomorrow is Black Friday. It seems that this day for shopping just about overshadows the gathering of family and friends and surpasses the glut of football games. All of this and more clouds my thinking as I prepare to reflect on thanksgiving. I thought about recapping the history of this national holiday. Then my mind went to memories from past family gatherings on the fourth Thursday of November. I considered describing my favorite foods of the season. Or I could tell you about different traditions associated with this special day. 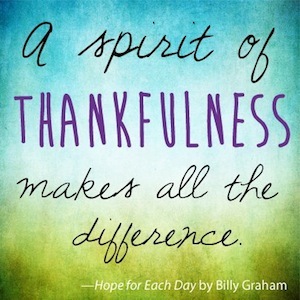 Instead I want to consider some of the attitudes and actions of thankful people. Not what thankful people do but what thankful people don’t do. Thankful people don’t complain. If a person’s heart is truly filled with gratitude, they are generous in their praise of others and expressions of gratitude for their blessings. When one truly appreciates life and all that it offers, there is no time or desire to register complaints. Thankful people focus on what they have rather than complain about what they do not have. Grateful people see things in proper perspective and recognize that things could always be worse so they celebrate regardless of the circumstances. People who are truly thankful don’t complain, they find reasons to be grateful. Matthew Henry, who wrote a commentary on every book of the Bible, was once robbed. The thieves took everything of value that he had. Later that evening he wrote in his diary these words, “I am thankful that during these years I have never been robbed before. Also, even though they took my money, they did not take my life. Although they took all I had, it was not much. Finally, I am grateful that it was I who was robbed, not I who robbed.” He had every reason to complain but instead he was thankful. Thankful people don’t hoard. Truly grateful people are generous with whatever they have and find pleasure in sharing with others. Their security is not related to things so there is no need to guard their possessions. Stockpiling material things or refusing to share privilege or power is a symptom of selfishness, insecurity, and ingratitude. It is obvious to me that the more we hold onto things the less thankful we are. The more we give away the more reason we have to give thanks. Thankful people really believe that it is more blessed to give than to receive. Thankful people don’t forget. They recognize that everything one has or achieves is not necessarily the result of their own ability, intelligence, or ingenuity. Many factors contribute to the benefits and blessings a person may possess. Thankful people remember the kindness and generosity of others.Genuine gratitude recognizes the contributions of individuals and realizes that opportunities and resources have been available to them that others might have been denied. While there are at least these three “don’ts” to thanksgiving, there are some things to do. Do give thanks, rejoice don’t complain. Do give thanks, be generous not tight. Do give thanks, don’t forget what others have done for you and most of all, remember God, who gave us His son for our salvation and has provided for us life eternal and life abundant. As we approach the National Day of Thanksgiving it is appropriate to examine our attitude. 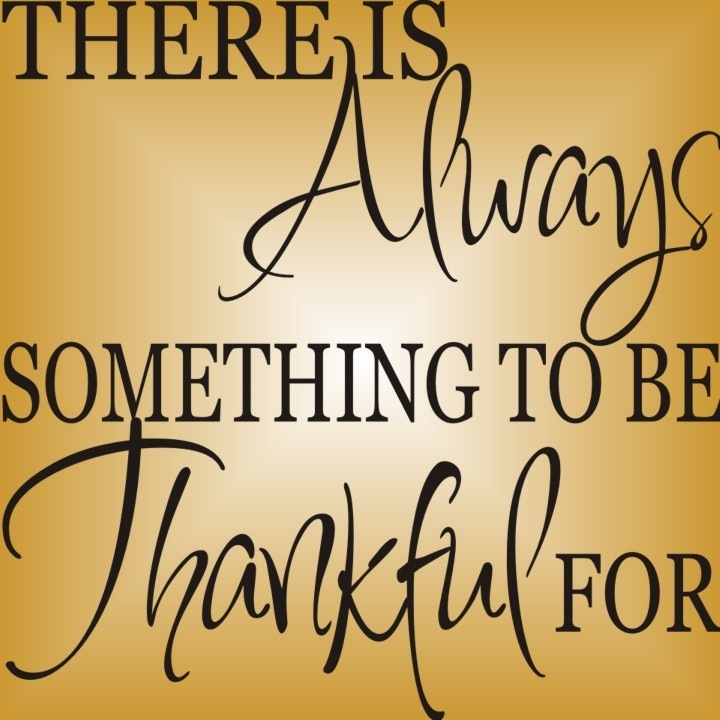 Is it one of thankfulness or do we suffer from the common sin of ingratitude? A young boy was given an orange by a man. The boy’s mother asked, “What do you say to the nice man?” The little boy thought and handed the orange back and said, “Peel it.” Is that the way we think and act? Cultivating an “attitude of gratitude” is a good thing. Research has shown that gratitude is associated with lower levels of depression, envy, delinquency and higher levels of academic performance, life satisfaction, self-esteem, hope and happiness. It is so easy to take the blessings of life for granted. My wife and I both grew up in Mobile, Alabama. In a recent visit we drove around the area and marveled at the beauty of the giant oak trees, the fertile farm lands, and the expansive skies. I don’t remember recognizing that beauty when I lived there. I suspect that I fail to recognize and appreciate much of God’s marvelous creation in Atlanta and the north Georgia region where I now live because I have become so accustomed to it. That reflection is of special interest to me because the author is my son. His insights demonstrate the kind of thankfulness that I am suggesting is beneficial for us and others around us. The Bible admonishes us to “Give thanks in every situation because this (thankful spirit) is God’s will for you in Christ Jesus” (I Thess. 5:18). Everything that happens to us is not God’s will but an attitude of gratitude is what God desires and expects from us in all circumstances. If you want to know how many left-handed, blue-eyed, young adults live in a particular zip code, there is a poll that can tell you. Are you interested in the flavor of ice cream preferred by bald-headed men over the age of 65 (Butter Pecan for me)? There is a survey that can give you that information. Looking for the shampoo that gives you healthy full bodied hair (I am)? Marketing analysts will be glad to guide you. We have come to rely on surveys, polls, and prognosticators to tell us what is popular or pricey. And usually the two go together. The cars we buy, the television shows we watch, the places we go on vacation depend a lot on this kind of data. Before the election last week, virtually all polls told us that certain political races were “too close to call.” The numbers suggested that it would probably take a while to determine the outcome of some pivotal positions and some would be determined by a run-off. The Atlanta Journal-Constitution reported that the polls showed “the two top races in Georgia were so excruciatingly close that both might have to be decided by runoffs.” But the outcomes were very different. In other words, the polls were wrong! Sometimes people just come to wrong conclusions but when they express them, others accept them as factual and true. Rumors get started and before you know it they take on a life of their own. Many people believe what they hear without any reliable third party verification or critical assessment. I watch and listen to news reports on radio, television, and the internet. I am one of a dying breed of people who still read the daily newspaper. I learn a lot and I think I am reasonably well informed. But I realize that everything I hear and read is not always totally true. However, there is one source that I have found to be completely reliable. I do not always understand all that it provides and sometimes I question what I read. It does not tell me everything I want or need to know and there are certainly different opinions about what some of it means. Nevertheless it has never misled me and I have never found it to be untrue. It offers an unlimited source of knowledge and guidance. I am talking about the Bible and I commend it to you. Almost two months ago I embarked on a new venture. I began driving an electric vehicle (EV). The Nissan Leaf that I leased was not intended to replace my gasoline powered internal combustion engine (ICE) automobile. The plan was that it would be my “commuter car” and I would keep my old vehicle for long trips. The decision to acquire an EV was reached after several weeks of research and conversations with numerous people who had already made the plunge. I considered the environmental value of a car with zero emissions and the financial implications of not having to purchase gasoline. Key to my final decision was the tax incentives that both the state and federal governments offered to encourage the use of zero and low emission vehicles. I also considered the age and condition of the vehicle I was currently driving. My 2005 Kia Amanti has served me well but it has 156,000 miles on it. My goal is to get 200,000 miles out of it but normal wear and tear will certainly require expenses for maintenance and repair. Reducing the miles driven would most likely reduce those costs. And there are the fuel costs. Currently there are almost 20 models of plug in cars on the market today. Several of them are hybrids that run on both gasoline and electricity. About a dozen of them are all electric. All of them offer the sweet speedy-but-silent driving experience only available from battery-to-motor power. A couple of Tesla models will get about 230-260 miles on a charge and cost approximately $80,000. The Leaf that I am driving is among the other cars from various manufacturers that get roughly 80-85 miles per charge and are priced $40-50,000 less than the Teslas. Forbes reports that last year 55 percent of electric vehicle buyers were between 36 and 55 years old. Nearly 21 percent have an average household income of $175,000 or more. About 44 percent of EV buyers have at least one child living at home. I do not fit the demographic described above whether you consider age, income, or family. I am not often on the cutting edge of things. I am not a serious environmentalist and live a “green” lifestyle. Nevertheless acquiring a Nissan Leaf seemed to be a good decision on all fronts. After hearing and reading a lot of the good and the bad about EVs I concluded that the technology has progressed significantly. Considering these advances, the government tax incentives, and the cost of gasoline that I would not have to buy, a lease on an EV costs little or nothing. I know that it sounds to good to be true but it is. I have put 1500 miles on my EV since mid-September and enjoy the quiet, comfortable, smooth ride. The Leaf is roomy and has enough power to navigate the surface streets as well as the expressways. It is very well equipped and the only reason I have to stop at the gas station is to purchase a hot dog or get a drink. I simply plug it in when I get home every day and it is ready the next morning. Someone said, “The world is moving so fast these days that the man who says it can’t be done is generally interrupted by someone doing it.” Every time I start my new car I am reminded that things once thought impossible are being accomplished every day all around us. That might be the best thing about my EV automobile. A wise man of long ago said, “Whatever has happened—that’s what will happen again; whatever has occurred—that’s what will occur again. There’s nothing new under the sun” (Ecclesiastes 1:9, CEB). That is true but often it takes a different shape and form.